Have you ever wondered why no two snowflakes are alike? Or why are all six branches nearly identical, even though they are formed separately? Snowflakes are nature's fascinating works of art. 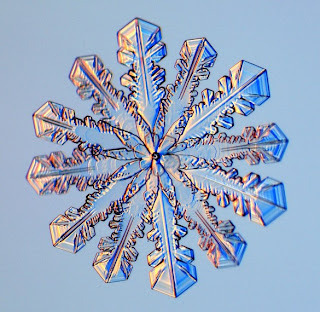 I like admiring a fresh blanket of powder as much as the next artist, but I've never realized how beautifully intricate individual snowflakes are up close. The website SnowCrystals.com (developed by physicist Dr. Libbrecht of Caltech) explores ice crystal growth under varying conditions. It is a complete guide to everything you will ever want to know about snowflakes, along with gorgeous high-resolution pictures and short time-lapse movies. 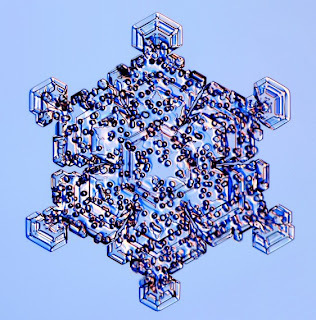 The diversity of snowflakes out there is astonishing—and they have been classified into over 40 different morphologies. The detail in every individual is breathtaking and I am fascinated by how the delicate lattices arrange themselves and bend light. 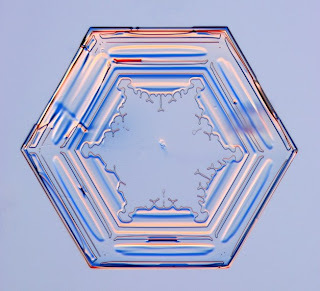 Along with a fantastic gallery, you can also read about how his lab makes "designer snowflakes." 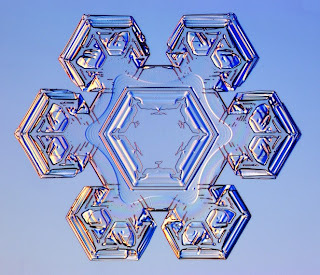 By altering precisely controlled conditions, they make a variety of artificial snowflakes that mimicked natural shapes. The website is full of pictures, diagrams, interesting facts and even fun projects for the young and inquisitive. 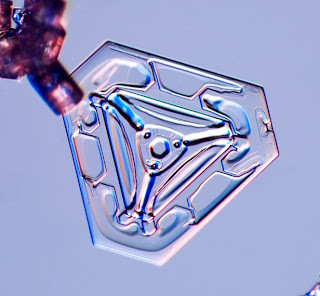 Although their shape is constrained by their hexagonal lattice structures, the possible shapes of snowflakes are seemingly endless because of the differences in each water molecule that crystallizes to it. There are about 1018 water molecules in a small crystal, and 1015 of them are different from the last. 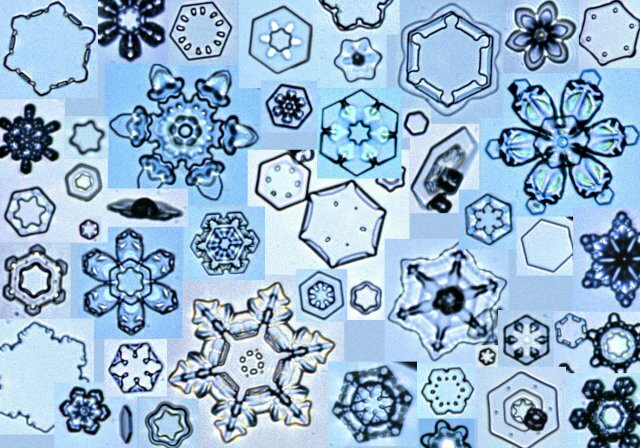 That means there are more possible combinations of water molecules that make a snowflake than there are atoms in the entire universe—and it is very unlikely that any two will have the exact same combination. 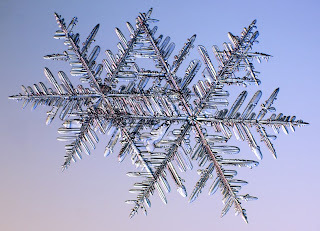 The branches of each snowflake can look similar—but not identical—because they are all formed under the same temperature, pressure, and humidity conditions. However, the vast majority of snowflakes are irregular and not symmetrical at all. 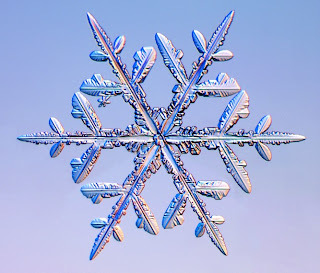 As humans, we are naturally attracted to things exhibiting symmetry, so it should be no surprise that symmetrical snowflakes are photographed more often than irregular ones. 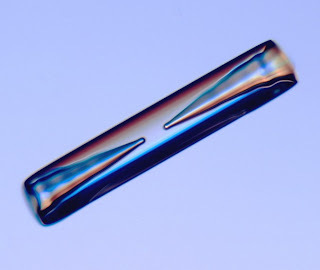 Learning about the physics of these microscopic crystals really makes you awe at the intricate wonders of nature. Do you think artists try too hard to replicate what nature does so well? Why do you think that is? I'm yet to see a snowflake for myself. Here in my city it has snowed maybe twice in the past 100 years. My father was in one of them back when he was a kid. I sure hope you get to see snow sometime soon! It's a lot of fun to play in, even if you can't see the details like in the pictures of this post. :) Are there any mountains near where you live that gets snow?